Ernesto Inarkiev: Peter confidently achieved a decent position; frankly speaking, I did not realize what happened. On 26.Be3 I planned to take the bishop until suddenly saw the refutation. After this I realized that I need to simplify the position. Nevertheless, I still had problems to solve, and made a couple of inaccuracies around the 40th move. Peter used them skillfully and squeezed the maximum out of his position, so I had to work really hard to make a draw. Am I tired? It is too early to speak about tiredness, because the tournament just started. However, I’d prefer to avoid such tough and lengthy games. Peter Leko: I analyzed this variation a lot and played with both colors, but usually I couldn’t get any advantage as White. I think both 17.Ra4 and 18.Be3 are very strong, and nevertheless I managed to obtain a certain plus. I fought until the end, set up traps, but my opponent defended very accurately. Evgeny Alekseev: The opponent surprised me in the opening a few times. I didn’t expect 11...Bf5 and 12…h6. By the 14th move Black didn’t have any problems at all. However, I think he should have castled longside. Later I got a slightly more pleasant position, although it was most likely drawn. There was another critical moment in the endgame, when I missed 34.h5 with some winning chances. Unfortunately, I hesitated too much. 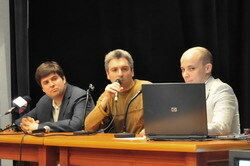 Vassily Ivanchuk: It seemed I equalized in the opening, but then started to play badly. After 34.h5 my chances to survive are slim (later Alekseev confirmed this evaluation – editor). It is a strange feeling. I am very surprised to survive with such a poor quality of play. Question: You keep criticizing your play for the second day in a row, does it mean that you are out of form early in the tournament? Ivanchuk: That depends on your definition of form. My physical condition is excellent, but I am not satisfied with the way I play. The first round was just a disaster! Yesterday I played well, but made one move in a wrong direction. And today I played absolutely horrible. I like everything about the tournament – excellent organization, friendly people, good playing hall; everything, but not my own play. 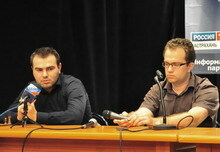 Vugar Gashimov: It was a typical Petroff. Usually White pressures, but Black can draw with accurate defense. I tried to attack, using the presence of the opposite-colored bishops, but Boris defended accurately and neutralized my threats. Maybe my play can be improved... In the actual game I had to force a draw with a rook sacrifice. Boris Gelfand: I had some problems in this line recently and even lost a couple of games. The struggle in today’s game was quite interesting. White pressured, but I couldn’t see where he could get anything real. I had to make the only moves a few times during the game, though. Pavel Eljanov: My opponent successfully used this variation against Vladimir Kramnik at the rapid chess tournament in Baku. Shakhriyar should get a credit for that victory, as after the opening the position was about equal. Playing White may be more pleasant because his plan – the minority attack – is very obvious. Black, however, also has his chances in the center and on the kingside, plus he has a bishop pair. I played 15...Rс8 to prepare с5, but continued with 16...b5, because I realized that my position is acceptable despite the weak pawn on c6. By trading my bishop for the knight on the 20th move I created the opposite-colored bishops, and White was unable to make any progress. Shakhriyar Mamedyarov: After yesterday’s nervous game it was difficult for me to keep a bloodthirsty mood. I decided to play solidly and avoid any risks. After the exchange on the 20th move it was clear that I cannot improve my position. I think we both were satisfied when we found the threefold repetition. Ruslan Ponomariov: This game was interesting but extremely solid, and a draw is the only logical result. Generally it is very difficult to shake such a solid position, especially when Black has counterplay. Teimour Radjabov: In was important to find the sequence 13...dc4 and 14...Be4 in order to activate the g7-bishop and improve the pawn structure. In the resulting position Black needed to carry out b7-b5 in order to get enough space, and after I made this break, White was left with a tiny advantage, which I neutralized with accurate play. Vladimir Akopian: I cannot say much about this game. This line occurred many times in the Kasparov-Kramnik match. White must find very refined moves in order to get an edge. I misplayed something probably, as it turned out that Black reaches a very comfortable position by simple means. When I saw the move repetition, I was unable to find arguments to turn it down. Peter Svidler: We played the variation that I had analyzed quite a lot. I had to spend some time to recall the things I knew, because I was unable to guess Vladimir’s first move in this game correctly. I think my 11th move is a novelty, because in that match 11...Nd4 was considered the main move. However, the resulting position was very similar to those. Objectively I could continue to look for chances in the final position, but yesterday I lost, and I still needed to fix my morale. In addition, I didn’t feel well physically. 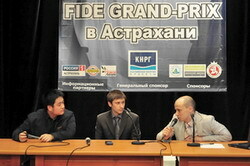 The Chinese grandmaster looked completely shaken at the press-conference. He said that he missed a win with his last move.